A lot of curiosity and a little ingenuity is helping two scientists uncover the mysterious lives of baby loggerhead sea turtles. For years, tracking such small animals in the open ocean has presented a big challenge to scientists studying loggerheads. At less than two inches long, baby loggerheads don’t travel well with big heavy tracking devices on their backs, and they grow so fast, it’s hard to attach something to their shell that will last.The question of where they go after they scramble away from the beaches where they hatch is an important one, because loggerheads are endangered. If we can understand their habits, we can change ours to protect them. To solve the mystery, two biologists from University of Central Florida, Kate Mansfield and Jeannette Wyneken, found a way to attach tiny satellite transmitters to the backs of the two-inch hatchlings. Their high tech solution? Manicure acrylic, pieces of old wetsuits and hair-extension glue. The researchers used those materials to attach transmitters to the backs of 17 baby turtles. They were able to track each turtle’s location and the water temperature where they traveled. It worked, and what they found out was surprising. In the past, what little information scientists had about the “lost years” led them to believe the turtles mostly just drifted or swam along with the main ocean current. Known as the North Atlantic Subtropical Gyre, the current makes a big clockwise rotation around the Atlantic. Mansfield and Wyneken’s work showed that the turtles don’t just go with the flow. In fact, they travel quickly through the gyre and leave it often to spend time in the Sargasso Sea where large mats of floating seaweed provide the protection, food and warmth that helps them grow. 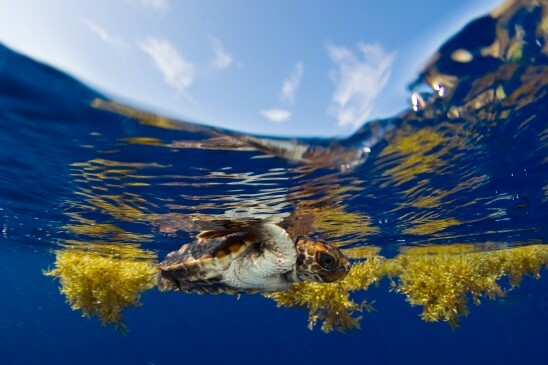 Loggerheads are one of four species of sea turtles listed on the endangered species list. The others are green, hawksbill, leatherback and Kemp’s ridley.